I’m almost positive this card’s art was an unused piece from Unstable. 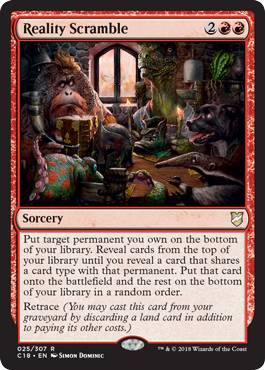 Like most cards that seem to give you something random, it’s almost easier to use it in a way that gets you something predetermined: use Krenko’s Command to give yourself a creature, cast Reality Scramble on it, and get a Darksteel Colossus. Of course, this actually has a little more nuance than an essentially dressed-up cheat card like Polymorph. For one thing, it’s any permanent you own – that means that if somebody’s enchanted your Chandra, Torch of Defiance with Faith’s Fetters, you can switch her for a new copy out of your deck. (Or a different version in a singleton format, or the exact same copy if you only have one planeswalker in your deck!) I was also surprised, in a good way, that it has the slightly obscure retrace ability from Eventide. This makes it more resilient as a combo card in the face of Thoughtseize and Mana Leak; but more generally, the only thing better than chaos is even more chaos! Well, this looks familiar. Kinda. As with any card with this text, Reality Scramble is less likely to be measured by what it does fairly and more what it does unfairly. Like cheating out copies of Blightsteel Colossus or Progenitus. That is a thing. The idea is simple: swap a permanent you don’t need for one that will do the job better. It has a bit of synergy with tokens, since they are still eligible permanents, and the way it is worded allows you to get things away from opponents rude enough to steal your stuff. While the control you have over what you get is limited by how you built your deck, this definitely is powerful, being able to tutor out a combo piece for the low price of four mana. And this has retrace, also a thing. So it lets you turn your excess land draws into something better. I don’t know exactly how good this will be: it’s definitely a card that invites abuse in deck building without being a one-shot effect, and it’ll be fun in Commander all the same, but there’s a feeling I have about it maybe showing up in Legacy. Because cheating out unkillable monstrosities will never go out of style.